Since my last post, I’ve become aware of a much better term for what I initially referred to as Unauthorised Foreign Versions – it’s ‘Remakesploitation’. With hindsight, International Remakesploitation would have been an even better term. Even though the majority of films in this category are derived ‘illegally’ from Hollywood properties, there are certainly many cases where the original films are Italian, or Australian, or British, effectively rendering the term ‘foreign’ totally useless. In any case, the term implies a certain position of privilege, even if it was not intended to be ignorant or xenophobic. Future instalments hopefully will cover the likes of James Batman (Artemio Marquez, 1966), the Filipino hybrid spoof combining Batman and James Bond, Os Trapalhões na Guerra dos Planetas AKA Brazilian Star Wars (Adriano Stuart, 1978), and the entire booming Bollywood Rip-Off industry. At any rate, this is obviously a huge genre, but where better to start rifling through this bizarre bazaar than Turkey, home of some of the most brazen Rip-Offs in cinema history and many unforgettably odd and entertaining movies? This first part will be followed very soon by a more general look at Turkish Remakesploitation. Many thanks to Gokay Gelgec of the Sinematik website and Bill Barounis of Onar Films for invaluable background information on these films and the culture they were made in. Please forgive the long lead-in, it will hopefully become apparent why it’s there. If not, don’t worry about it too much. In his Eisner Award-winning series, All-Star Superman, Grant Morrison described the basic Superman myth with refreshing economy – “Doomed planet. Desperate scientists. Last hope. Kindly couple.” It’s the essence of a story that was synthesised and refined from a range of elements to be the quintessential modern American myth, perfected and endlessly repeated until it entered the common consciousness. Its creators, writer Jerry Siegel and artist Joe Shuster, cherry-picked elements of successful heroes of the screen, sci-fi novel and comic book panel and mixed them in with their own cultural, generational and personal preoccupations to produce a Superman that tossed villains around with scant regard for their physical safety, deflected bullets but not bombs and leapt but could not fly. For the readership then, it was enough to make Superman a massive success. After short-sightedly signing away the rights to their creation to people who in turn could have had no real idea how profitable they would turn out to be, Siegel and Shuster were gradually sidelined by the legal owners of Superman while countless writers and artists took their turns in updating and amending Superman’s character and back story. Alongside successive comic creative teams, radio and television writers developed the property, as it now most certainly was, adding key elements to the core story; Superman flew for the first time as a concession to TV animators who found it easier to excise the transitions necessary for an Earth-bound Man of Tomorrow. Kryptonite similarly was introduced in part to allow the star of the Superman radio show to take time off. At a certain point, Superman’s abilities became dramatically untenable – it’s tricky to consistently write believable threats for an omnipotent being – necessitating a reboot in the 1980s drastically reducing Superman’s powers. Eventually, Siegel and Shuster were no longer even publicly acknowledged as the creators of Superman. It was only the production of Superman: The Movie (Richard Donner, 1978), with its multi-million dollar budget, that forced Warner Brothers, battered with negative publicity, to compensate the Man of Steel’s creators, now living in shaming poverty. The film was undeniably big business. With their highly-publicised case (somewhat) resolved in 1975, Siegel and Shuster could settle into their seats at the December 1978 Hollywood premiere of Superman: The Movie and see their creator credits burst across the screen. And so, 6,000 miles away in Paris, could Kunt Tulgar. 30 years old then and away from his home in Turkey, he was watching the film with his family. As a child, Kunt Tulgar had starred in Tarzan Istanbul’da (Tarzan In Istanbul, Orhan Atadeniz, 1952), a film produced and shot by his father, Sabahattin Tulgar, who was subsequently taken to court by Tarzan’s American copyright holders. In their defence, the filmmakers produced a 50-year-old Turk named Tarzan whose name, they counter-claimed, had been stolen by the Americans and whose rights pre-dated the 32-year-old US copyright. They reportedly demanded a cheeky $10,000 compensation from the Americans and it’s probably fair to say this was a formative experience for the young Kunt. After pursuing a career as an actor, he made his directorial debut in 1974 with Tarzan Korkusuz Adam (Tarzan The Mighty Man). Five years later, watching Richard Donner’s film in Paris, Tulgar was encouraged by his father to make a similar film. Returning to Istanbul enthused with the idea but with approximately $54,985,000 less to play with than the American producers, he and his wife, Emel Tulgar, set about special effects tests. Tailoring a costume for one of their daughter’s Ken dolls, they filmed it in front of a tracing paper background, projecting looped images of Istanbul on to the paper, and were sufficiently satisfied with the results to begin production on Süpermen Dönüyor (Superman Returns, Kunt Tulgar, 1979). Kunt Tulgar cast his first choice for Superman, his friend Hasim Demircoglu, (credited as Tayfun Demir, apparently because his real name was unmarketable) on the basis of his height and athleticism. Demircoglu was not a professional actor and Süpermen Dönüyor would be his only film role. For anyone that has seen the film it might seem unnecessary to explain why, but then he wasn’t hired for his acting ability, and this certainly wasn’t intended to be Shakespeare. His performance is fantastically totemic, more golem than superhuman. Because Demircoglu wasn’t interested in putting himself in danger (in stark contrast to the standard Turkish action stars, typified by Cüneyt Arkin, who generally and enthusiastically did all their own stunts), his Superman doesn’t do many stunts – he simply exudes power. Because he was hired as a friend of the director, he wasn’t paid either, which may account in part for his reluctance. When confronting enemies, he generally stands imposingly immovable, waiting for them to be stupid enough to attack. When bullets aren’t ricocheting off his chest, he’s catching them in his hands. When he flies, shots of the SuperKen doll are enlivened with the use of a studio fan to flap his cape and that stock footage of Istanbul behind him, including some of people waving from a boat, who Superman simply ignores. Close-up footage of Demircoglu is cut into the flying sequences and he often leaps from a short distance in the air into shots, to complete the effect. More interesting, perhaps, is Superman’s alter ego – not Clark Kent, or even Kent Clark, as in the earlier Süper Adam Istanbul’da (Yavuz Yalinkiliç, 1972) – but simply Tayfun, mirroring Demircoglu’s stage name. Tulgar’s adaptation is shaped not only by the extreme budgetary restraints, but also, more importantly, by the need to make the film relatable to its Turkish audience. Crucially, there’s no attempt to pretend that the action takes place in the US. Instead of a fortress of solitude, there’s a cave where Superman’s Kryptonian father appears before him, fills him in on his legacy and then explodes, leaving Tayfun resplendent in full costume, ready for action. He proceeds to take on a criminal conspiracy based around a Lex Luthor archetype named Ekrem (Yıldırım Gencer) and battle countless nameless thugs that only manage to overpower Tayfun in order to facilitate a perilous conveyer belt/guillotine scene. 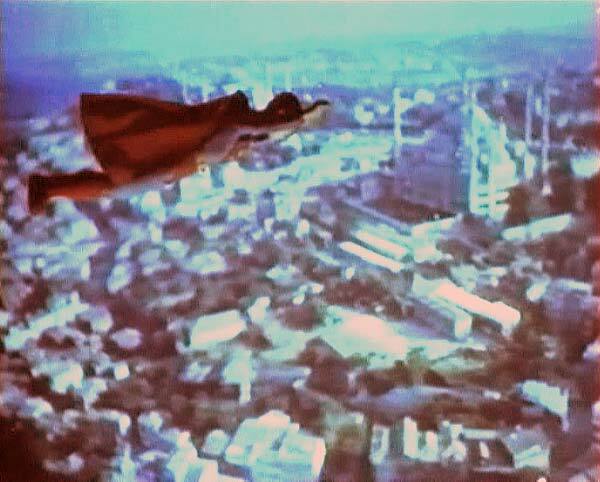 It wouldn’t be the first Turkish Superman – many previous movies had made use of the character, or at least the name and the costume – but Tulgar’s determination to show Superman in flight (the major selling point for the Hollywood film after all) set it apart. And just as Superman: The Movie was one of the first of a new kind of film, soon to be termed “blockbusters”, Tulgar’s Superman would be the first to so directly and explicitly rip off an American film. Prior to this, American movie serials and comic books had been a major source of inspiration for the Turkish film industry (referred to as Yesilçam (Green Pine) in the same way Hollywood became a shorthand for the American industry). The difference in this new wave of Turkish remakes was their unashamed appropriation not only of the ideas, imagery and themes of their source material, but actual elements of the Hollywood product they were imitating. Music and special effects shots were fair game for reuse and, with a gap in the market provided by a lack of wide distribution for major foreign releases, combined with the twin attack of television and VHS on domestic cinema revenue, Turkish filmmakers had a remit to produce a myriad of cloned, audience-friendly movies. Süpermen Dönüyor is ultimately a triumph of imagination, chutzpah and cultural indefatigability. It’s ridiculously easy and self-congratulatory to criticise the methods employed and the end results (which, admittedly fall short of other more energetically gonzo examples of the same genre) but the context here is all-important. Think of the making of it as a David and Goliath story and you’re halfway there. David would have to be an opportunistic idealist with a practical knack for knocking out movies on the cheap. But it still stands as a fascinating attempt to hijack an American money-making juggernaut for local consumption. The film was successful enough to make money, but not on the scale of Donner’s film and largely due to the severe economy of the production (besides Demircoglu performing for free, the other actors were paid “very little” according to Tulgar). Since it was made, there have been six major Hollywood sequels (including Supergirl (Jeannot Szwarc, 1984) and Brian Singer’s own Superman Returns (2006), which, as far as I know, made no attempts to acquire the rights to Tulgar’s title). There have also been three live-action TV series, two animated series and five straight-to-DVD animated movies. Mark Millar’s comic series Superman: Red Son has taken a more considered look at the possibilities of Superman crash-landing somewhere other than Kansas, reimagining him as a champion of Stalinist values. Close to 30 people have officially played Superman since the 1940s and, of course, the comic books have weathered many storms and continue to be major sellers for DC. The Turkish remakesploitation genre is, however, dead, killed off by TV and VHS. The films themselves are not easily found these days, even in Turkey. The internet, with its lack of borders, general disregard for copyright and unquenchable thirst for oddities has regenerated interest in the films. Kunt Tulgar is 63 now and still harbours dreams of making a return to movie-making. Hasim ‘Tayfun’ Demircoglu sadly died a few years ago at the age of 44. Jerry Siegel and Joe Shuster are both dead now, but the ownership and control of Superman continues to be embroiled in legal issues. (One reason why Zack Snyder’s new Superman movie is being rushed into production is so that the rights do not automatically revert away from studio control – the same reason for Roger Corman’s legendarily rubbish and unreleased Fantastic Four film, fact fans!). The chances of a movie like Süpermen Dönüyor getting made today are slim, given the internet’s ability to disseminate new releases, through authorised channels or otherwise, faster than a speeding fibre-optic connection (or at least at the same speed), and, sadly, due to the general homogenisation of global culture. Some might say the likes of Süpermen Dönüyor were merely a stepping-stone to this juncture. But they are also the thread that, once pulled, unravels a whole culture of mind-bending, thrilling movie-making that simultaneously undermines that homogeny and challenges modern audiences to do it better, if they can be bothered. A much more in-depth look at the creation of many legendary comic book characters can be found in Gerard Jones’ book Men Of Tomorrow. Bill Barounis at Onar Films has been tirelessly sourcing prints and rights for Turkish “Fantastic Cinema” and releasing them on DVD, with lots of extras. Buying DVDs from Onar Films gives you much better quality than YouTube or downloads and more importantly allows Bill to continue sourcing and releasing these gems. You can buy directly from Onar Films at their website, www.onarfilms.com. This entry was posted in Movie Rip-Offs, Turkish Remakesploitation and tagged Film, Kunt Tulgar, Movie Rip-Offs, Remakesploitation, Süpermen Dönüyor, Superman, Tayfun Demir, Turkish Superman. Bookmark the permalink.